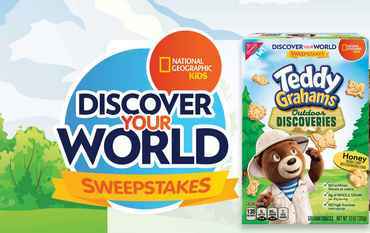 Teddy Grahams Outdoor Discoveries teamed up with National Geographic Kids to brings you the National Geographic Discover Your World Sweepstakes where you could win an 8 Days family Expedition for 4 to Grand Canyon, Zion, and Bryce Canyon National Parks. Trip includes: hotel accommodations, Free meals, Airfare plus a single cash payment in the form of a check in the amount of $11,152.00. During the sweepstakes period go to this link www.natgeo.com/teddysweeps. There is a limit of one (1) entry, per eligible person, per entry period. When To Enter: The National Geographic Discover Kids Your World Sweepstakes begins on or about May 1, 2018 at 12:01 a.m. Eastern Time (“ET”) and ends on July 30, 2018 at 11:59 p.m. ET. Sponsor: National Geographic Partners, 1145 17th Street NW, Washington, DC, 20036. Sweepstakes Prize: The Grand Prize Winner will receive the following (the “Grand Prize”): The Grand Prize consists of an eight (8) day National Geographic Family Expedition for four (4) Grand Prize Winner and three (3) guests (one adult companion and two children or alternatively winner may elect to bring three children in place of an adult companion) to visit the Grand Canyon, Bryce Canyon and Zion National Parks on one of the available departure dates in 2019. The trip consists of the following: double occupancy standard hotel accommodations for seven (7) nights and some meals are included. Airfare to and from St. George, Utah for four (4) is also included.